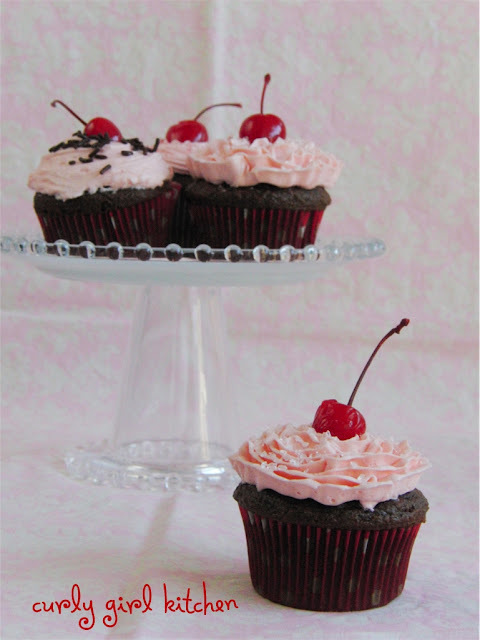 An idea for cherry coke cupcakes is something I've been keeping on the back burner for a while. 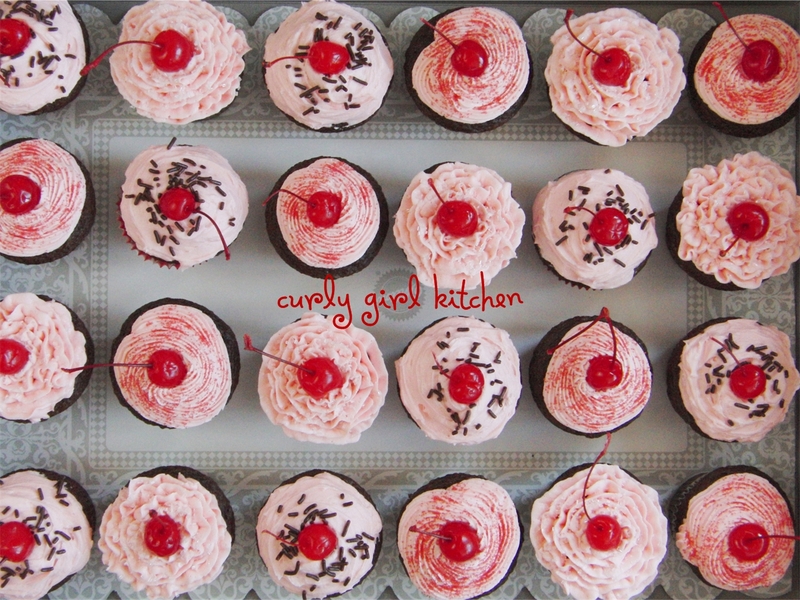 So when a friend ordered two dozen cupcakes for a BBQ that was also a belated celebration of a new baby girl, and asked what I would suggest, I thought it should be something pretty, sweet and girly, but still suitable for a BBQ since the party wasn't strictly a baby shower. 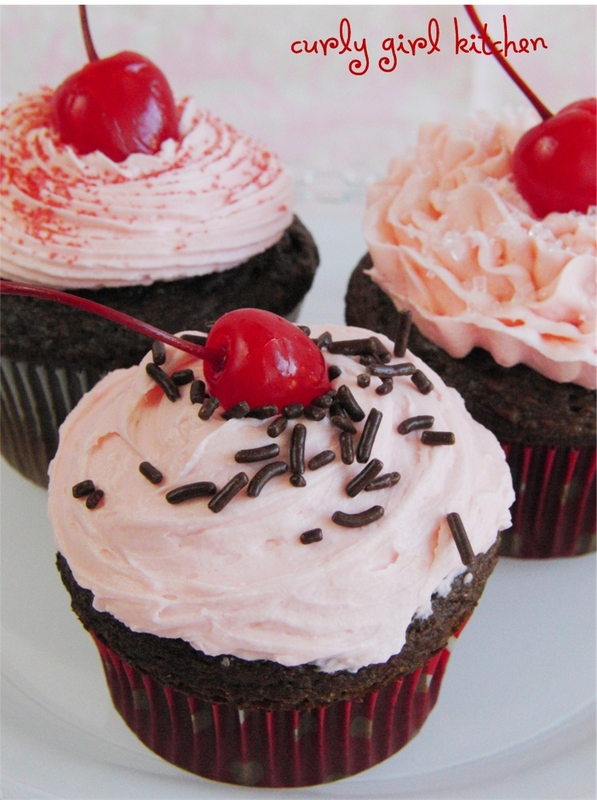 And these cupcakes came to mind. A chocolate cupcake, with a syrupy Coca Cola reduction in the batter and a maraschino cherry hiding inside each. 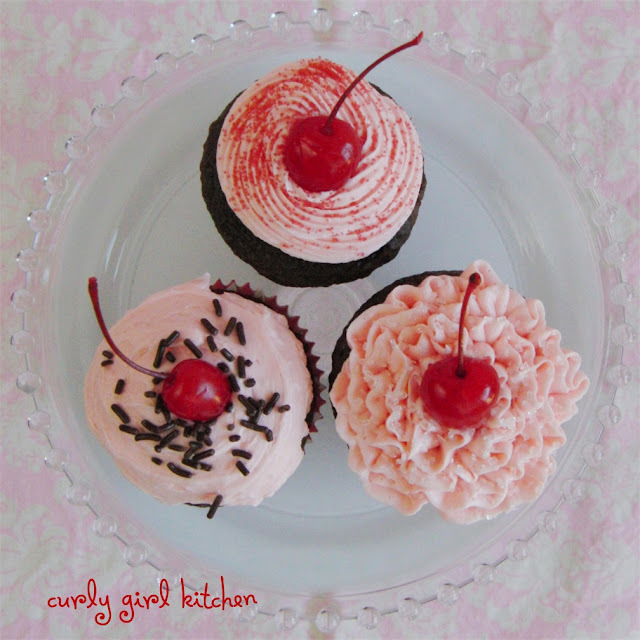 Cherry buttercream, pink and sweet with maraschino cherry juice reduced to a thick syrup, and topped with sprinkles and a cherry. 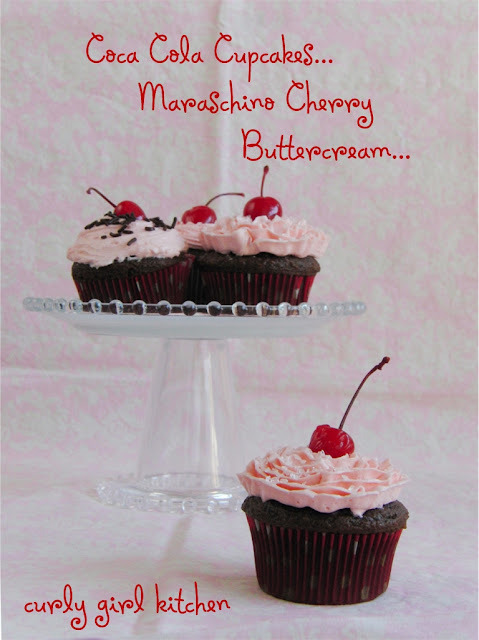 The cupcakes were a hit at the party, and people even asked for my "card"! Something I should think about getting made, now that I'm starting a business. 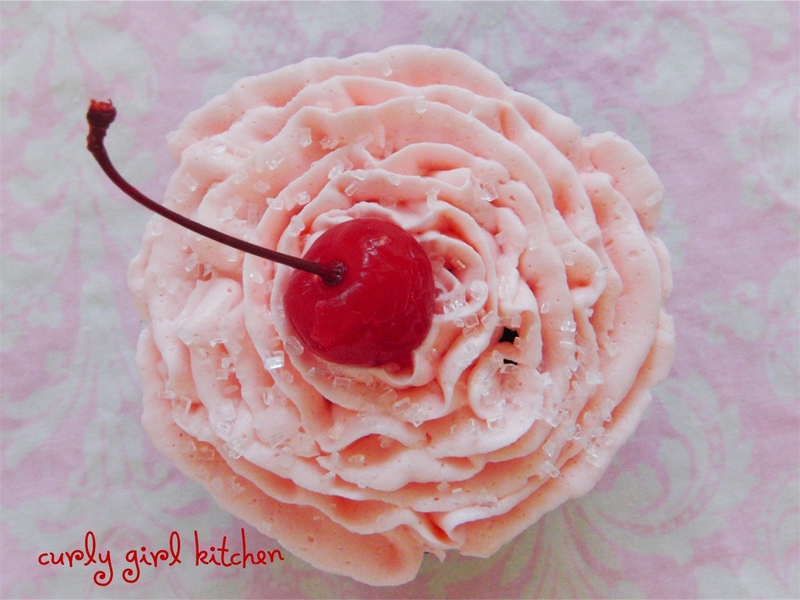 And I'm so happy that this cupcake, which was nothing more than a vision in my head until now, was such a big success. Preheat the oven to 350. Line pans with 24 cupcake liners. Pour the Coke into a saucepan and place on the stove over medium heat. Simmer until reduced to 3/4 cup. In the bowl of your stand mixer fitted with the paddle attachment, combine the reduced Coke, the cake mix, flour, sour cream, oil, eggs and vanilla, on low speed for 30 seconds, then on medium speed for 2 minutes until well combined. Place a cherry into each cupcake liner, then fill the cups 2/3 full of batter. Bake for 16-20 minutes, until a toothpick comes out clean. Cool in the pans for 5 minutes, then transfer to a wire rack, cover loosely with a clean kitchen towel and cool completely. 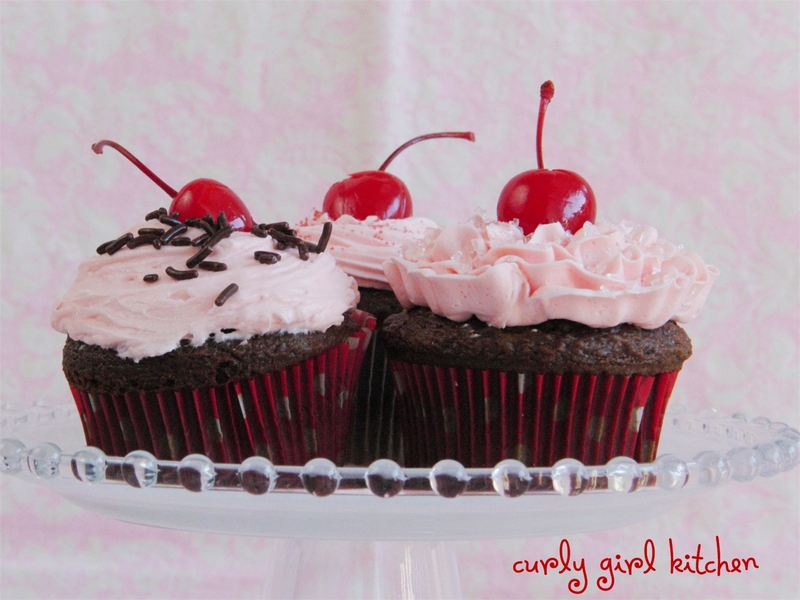 To make the frosting, first pour the cherry juice into a small saucepan and place on the stove over medium heat. Simmer until reduced to 1/2 cup; when it starts to bubble and foam, it's getting close. Set aside to cool completely to room temperature; the syrup will be extremely thick and sticky, like honey. In the bowl of your stand mixer fitted with the whisk attachment, combine the softened butter and 3 tablespoons of the cherry syrup on low speed. Add the powdered sugar and the meringue powder, mixing on low to combine, then add the vanilla. Increase speed to medium high and whip until light and fluffy, scraping the bowl once or twice if needed. Add more of the cherry syrup, if you like, or refrigerate for another use. 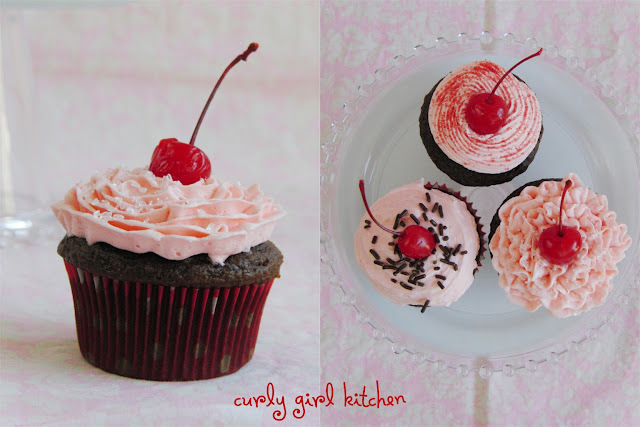 Pipe or spread the frosting onto the cooled cupcakes, then garnish with sprinkles or colored sugar, and a cherry.